Red or Blue Two, Too, Tue?? Another color test in different light and dry concrete docks. These were sent by a friend that now lives around Polson, they have an annual Crafts Fair and Car Show, It was held Saturday. Several nice cars, my personal favorite is the “Rat Rod,” gotta love it. Thanks John – they are nice. A few pictures from earlier years, the picture of my transom is from when I first got Heart of Gold and a skipper with 12 more feet of waterline tried to roll over us in light wind – no he was not successful. Great group – 8 to 12 knots of wind, 3 inch chop, sun, Mt. Baker and Mt. Rainier were both out, fine food – one big hole in the wind right in the shipping / VTS lane we had to power out of to get out of the way of the tug and tow, but other than that all was well. Started with light wind and filled in to 8 to 10 knots for most of the afternoon, sun was out, good company and good food, everybody did a good job. A few pictures, at least one good one for every one, and yes a few open mouths and a couple of “don’t point the camera at me again” look. This is a DRAFT of a Nav. Exercise for small boaters. It is in the review stage so there may be revisions for the final relief. The Chartlets should be printed 11×17 inches – about $ 0.25 at your local Copy Center. Or you can tile them when printed 8.5×11 on 2 pages – adjust the scaling to require only 2 pages. Or any properly scaled chart of the area from West Point to Whidby Island. Laura Sokey at the helm sailing in Seattle off Shilshole. 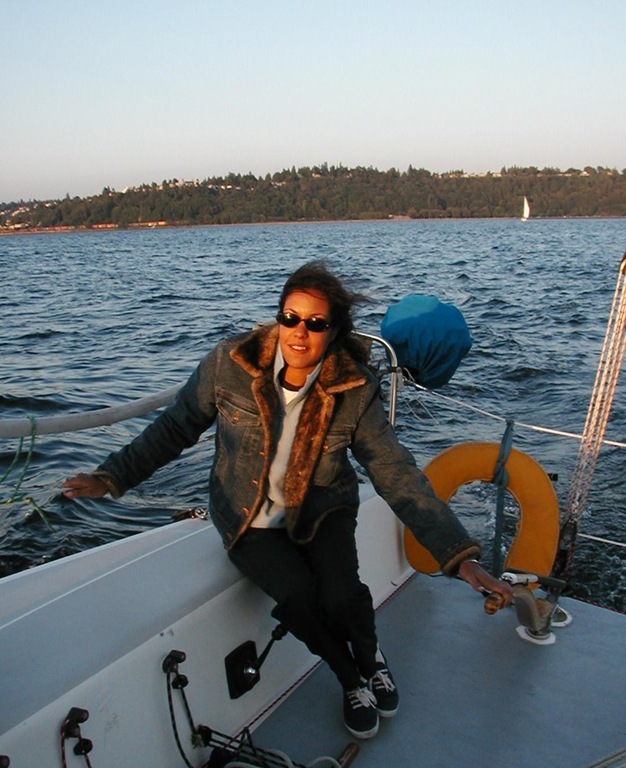 A few pictures of Laura Sokey sailing while she lived in Seattle. Laura was a lawyer in Seattle (well Belleview actually) who liked to sail. Laura spent as much time as she could sailing with friends.